** This is what I encountered as of April 16, 2018 so this may no longer be accurate. Also, note that this is for the preview version. Googling for ‘dotnet new “azureFunctionsProjectTemplates”‘ resulted in a single link. That link contains the instructions on how to install the item and project templates as well as how to create, build and run a new project. You might need to adjust the version of the Microsoft.NET.Sdk.Functions package reference in your csproj file to match whatever version of the SDK that you used to install the templates. I had planned on writing out a much longer version of how I got things running, but I’m not. We can adapt an example of Using the JSON User Defined Functions from the Microsoft.Analytics.Formatting.Samples.Formats library in the U-SQL Examples repository on GitHub. Once we’ve built and registered the assemblies, the script is rather straightforward. First up, we need to reference the assemblies we just registered. In this next bit, we’ll use the JsonTuple function from the Microsoft.Analytics.Samples.Formats library convert the JSON string into a dictionary. Once we have the dictionary, we’ll pull values out of it. Finally, we’ll output the expanded data so we can check our work. The full script and a sample file can be found here. When looking at options for replacing Worker Roles in Azure Cloud Services, more and more, Azure Functions look to fit the bill. I like the idea of just writing code that focuses on what needs to be done and not having to write plumbing code like polling a queue, handling parallel execution or dealing with poison messages. 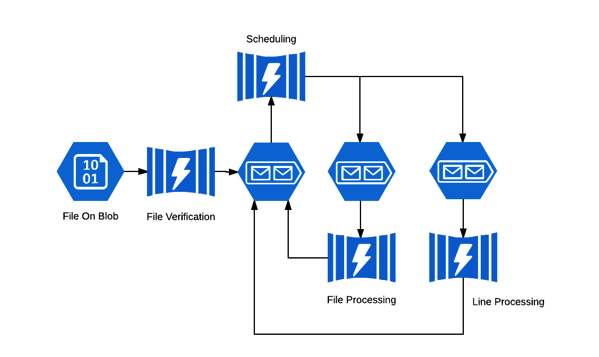 With Azure Functions, you can trigger your code using blobs, event hubs, queues, timers and web hooks. Now that Azure Functions can run on Linux and in a Docker container, we can deploy it however we want. To explore this idea, we’re going to build a small proof of concept. A text file will get dropped in blob storage container, which will trigger a function that will verify that it has contents. If it does, another function will read the file and split it by line and save each line into separate files. Once the split is done, work will queue up for the another function that will uppercase the contents of each new file. All of the functions described so far will not enqueue work for other functions. That will be left to yet another function that will handle scheduling of work. I should mention that while I’ve used some of these technologies before, some of this is still new to me. This feels like it should all just work together nicely, but I haven’t really dug in to it yet. In the next post we’ll take a crack at designing/implementing the first function, the scheduler.